You can learn a lot about a place on Wikipedia, but you can only learn to love a place by experiencing it first-hand. It wasn’t until I got to Denver International Airport that I finally had time to study up on my upcoming ski trip to Mont Tremblant. 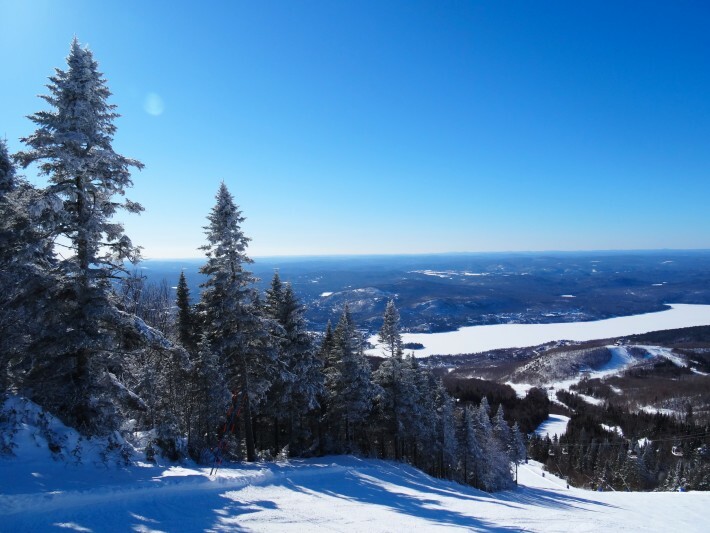 At 2,871 feet, Mont Tremblant is one of the tallest peaks in the Laurentians and the local Algonquins named her the “trembling mountain.” It does get cold here, so maybe that’s what the tribes were referring to, but now days Tremblant treats skiers and riders to one of the most solid ski experiences in North America. My itinerary included two nights at the Holiday Inn Express. Holiday Inn is a classic American motel chain where my family often stayed when I was a child. No matter where we were, if we were staying at a Holiday Inn it meant we were some where having fun as a family. 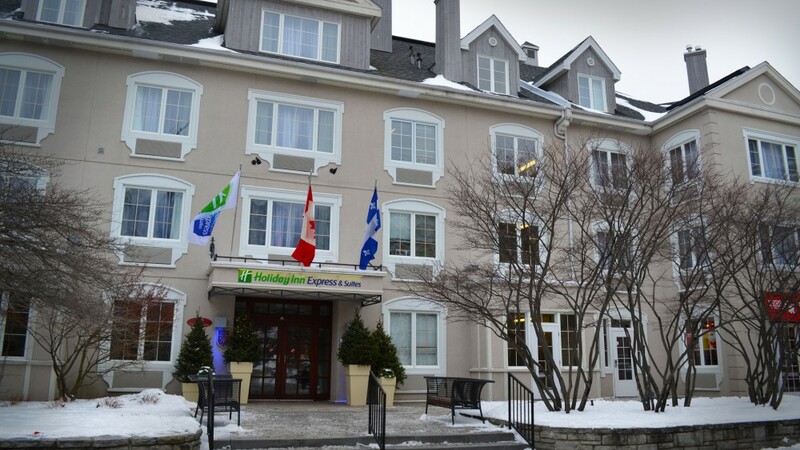 But make no mistake, the Holiday Inn Express at Mont Tremblant is not your father’s hotel. Ski trips require enough space for all of your stuff, and the spacious 141 guest rooms here provide you with that and a whole lot more. The hotel recently underwent a $3.2 million makeover including a state-of-the-art fitness room, sauna, free Wi-Fi that actually works, and an outdoor hot tub and swimming pool. Wake up to the Express Start breakfast bar packed with a bounty of everything you need to start your day including eggs and bacon, hot pancakes, fresh fruit, and endless gourmet coffee. The abundant spread is laid out in roomy lounge with granite countertops, high-top tables, leather furniture, and a fireplace. I loved the work stations where I could take care of a few a last minute work details before hitting the slopes for the day. 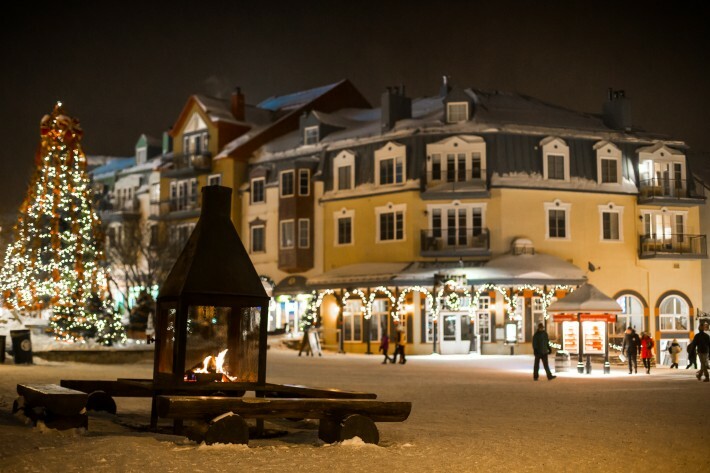 From the Holiday Inn the gondola is just a short stroll away through the “Vieux-Tremblant.” Joe Ryan’s vision for the village was to invoke an aura of France in the 17th and 18th centuries. Quaint stone and mortar buildings resemble Laurentian farm houses. The village has seen changes through the years but it still stands as the model ski area village that other places went on to imitate in their designs several decades later. It’s said that Joe’s ghost still roams the village. If it’s your first time to Tremblant, I’d highly recommend starting your day by pairing up with an InfoSki Guide at the top of the gondola. My guide was Norm, and he knew everything I needed to know to having the best day on the mountain and shared the rich history of Mont Tremblant. Every run has a name, and there’s a story behind all of the 96 trail names. If it weren’t for Norm, I would have never known that the run Fuddle Duddle was named after the F-word. If you want more on that, go meet up with Norm. You don’t have to log on to Wikipedia to know that the Canadian French love their food. Norm and I enjoyed a coffee and amazing hot beef stew in The Refuge, a cozy, low-key log cabin on the Versant Sud (south side of the mountain). At the end of your day, more amazing food awaits you in the village. I don’t know how many Cajuns ski, but aromatic Creole seasonings cut through the cold like no other. This is food built for skiers and Fat Mardis brings New Orleans 1,400 miles closer with a menu of Po’Boys, Creoles, and Jambalaya. You can boil an awesome day on the mountain down to seven simple words: Eat, ski, eat, ski, eat, sleep, repeat: A belly full of shrimp creole and a good night’s sleep in a quiet room and comfortable bed, and you’re ready to start it all over again.